I heard the nicest thing on As It Happens the other day, something that kicked off the Christmas season for me and reminded me that sometimes life turns out as it should. Turns out that someone who loves A Christmas Story even more than I do has purchased the house in Cleveland where the film was shot and restored it to the original state that you see in the film. He also purchased the house across the street from it, which now serves as A Christmas Story museum. And the whole thing was financed throught the sale of Red Rider Leg Lamps! 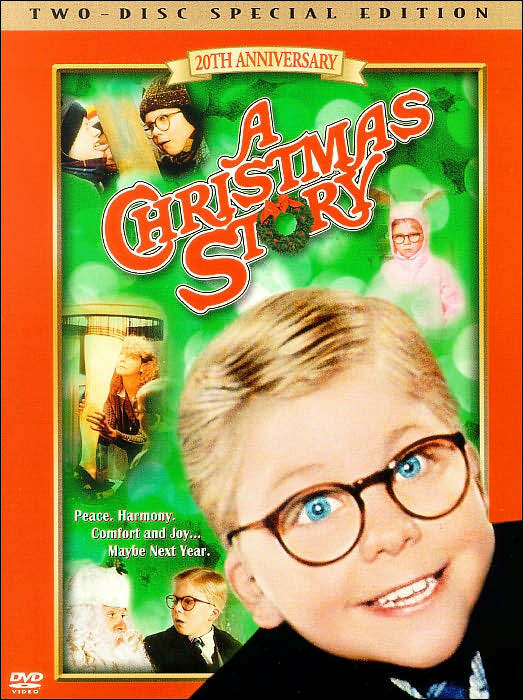 A Christmas Story is a film which I must watch every December. It is heartwarming and nostalgic. It is sentimental while still being hilarious, which is a really difficult feat to pull off. I still remember the first time I saw A Christmas Story. I was in grad school and my friend Darryll and I were invited to our other friend, Teri's, house for a turkey dinner prior to us all going our seperate ways for the holidays. Teri and her husband Steve had sold their house and were living in a tiny townhouse while they were building their new home. Plus they had a month-old baby. But they still had the energy to invite a couple of starving students over for a homecooked meal, which we gobbled down while squeezed into the miniscule kitchen. After stuffing ourselves, we waddled over to the living room to plop onto the couch and veg in front of the tv. We watched A Christmas Story and laughed ourselves sick (well, the excessive turkey probably contributed). Every year since then I have to watch it at least once. But if you've only got 30 seconds to spare, you can watch the bunnies' version on Angry Alien. Great movie. Have you seen the cellphone commercial that does a take on it? I hate it for trying to hock cellphones to kids, but it is well done. Instead of the "you'll shoot your eye out, kid" line, they have "you'll run your bill up, kid." My all time favourite holiday movie is Christmas Vacation. Even though I own it on dvd, I make a point to watch it on television each year. Its the best reflection of my family, sadly. Without the antler punch cups...I'm still searching for those. One day, one day. BTW, are you happy with the new Alberta Premiere choice? No, I haven't seen those ads, John. Grrr to pimping more cellphones but you have to love anyone who evokes A Christmas Story. Love the antler cups! The closest thing I have are Kool-aid cups. I spent the weekend saying "I did not expect that" about both the Alberta PC leadership and the federal Liberal leadership. I'm actually a little optimistic about Ed Stelmach as premier. He's moderate, and he's not Ted Morton. What do you think of Stephane Dion as Liberal leader? You know, I think I'm ok with Stephen Dion as the leader of the Liberals, because I think he brings potential to the table. But me liking him might have a lot to do with my dislike of Michael Ignatieff. I know I'm probably in the minority (of the public) but I didn't think Ignatieff really deserved to win, I think he needs to be more emerged in our culture and politics. Just moving back after 20 plus years in the US, I think its best to work your way up the ladder. (I did like some of his ideas though). That said, Dion really did not step up to the plate as environment minister, although now his platform has been reformatted, its going to be interesting seeing everything play out. And how he makes way in Quebec. Who know, watching the Jean Chrétien give his little speech at the conference and poke fun at Harper, I started to miss the old bugger. Disagree with his politics or not, he can tell a funny story. I've never seen A Christmas Story. My favorite Christmas show is the original animated Grinch. Love that show, can watch it over and over. If I'm alone I happily belt out the songs completely out of tune but who cares! One of my grade 12 students last year was obsessed by the bunny movies and was constantly emailing me which ones I just had to watch! That post made me think of him and all his crazy antics. Thank you. My favourite christmas movies are Laurel & Hardy comedies believe it or not. I know they don't have a christmas theme but when I was a kid they used to show one every day during the period 24th - 31st December. O.K their humour is probably from a bygone era, a time when you didn't have to shock or cuss to raise a laugh. I just watched the latest Jackass movie and realised that sadly, this is what makes people happy nowadays. I think I was born a 100 years too late. I saw this for the first time last year - it's really funny! And pretty much sums up childhood for a lot of us. The bunnies did a good job. I heart the bunnies. Never apologize for a long comment, Allison, you made some excellent points. I think it will be interesting to have an academic instead of a lawyer heading up the liberals, and I had some issues with some of the things that Ignatieff has said, although he has claimed that they were sound bites taken out of context. I think in Alberta we'll probably be feeling the same way about Ralph Klein that you do about Jean Chretien - that you could always count on them to say something outrageous. I only have A Christmas Story on VHS, Mel, and I'm not planning to sit down in our cold grungy basement to watch it, but I just saw that it will be on tv a couple of times, so I'm going to watch it then. I love the original animated Grinch too, Toccata, but hated the Jim Carrey remake. But you don't need to be alone to belt out the songs! Belt some out at work today! Glad the bunnies could bring back some memories for you. Watching a Laurel and Hardy film every day obviously made some great Christmas memories for you, Ben. I can't say I am really all that well versed in Laurel and Hardy, but they are not as slap-stick as the Three Stooges are they? Becuase I just don't get slap-stick (which I view as a cleaned up version of Jackass). The bunnies are so great, Karen. Yes, there are so many elements in A Christmas Story that so many of us (who grew up with winter anyway) can relate to - frozen tongues, those snowsuits in which you couldn't move, it all comes flooding back. I've not seen it either but I REALLY want one of those lamps. A lot. Loved the bunnies! One of my favourite Christmas movies is The Ref with Dennis Leary, Judy Davis and Kevin Spacey. It's one of my traditions. I may have to check out all your favourites now. Those leg lamps are a major award, Kees! I think every stylish house needs one or two. The Ref is great! I showed my work friend Jen the bunnies video and she loved it! Christmas Story is one of her favs too! I don't remember the Christmas story going quite the way the bunnies say. I was watching Polar Express on TV the other day and I have to say That is my new favourite Christmas movie. Then there is the Nightmare Before Christmas...that was good too. I finally saw A Christmas Story beginning to end last Christmas for the first time. "You'll put your eye out!" My favorite Christmas movie is Bill Murray's "Scrooged." It's got my all-time favorite line in a movie, "The b*tch hit me with a toaster!" And I feel I am fated to own one of those lamps one day. Is Polar Express the one they made based on the Chris Van Alsburg picture book, Barbara W? I haven't seen the film actually. The book is very cool though. Hi Johnny Yen - welcome! I want to visit that house in Cleveland now, maybe snag myself a leg lamp while I'm there. I haven't ever seen Scrooged, but now I am intrigued. How can you resist a line like that? O.K., can you still know me if I say my favorite Christmas show is The Charlie Brown Christmas? And, running a close second, is Rudolph? I'm just a big kid at heart. You are, Deb! You know, I used to think that Charlie Brown was cheesy and corny beyond words, but is has been growing on me. Embrace your choices! Isn't that the coolest thing, Johnny Yen? I'm surprised everybody doesn't have a leg lamp by now! I haven't seen that one - I will have to rent it! My gramma and I are obsessed with Christmas movies. My favorites are White Christmas, with Bing Crosby and Rosemary Clooney, and Mrs Santa Clause with Angela Lasbury. The Santa Clause trio with Tim Allen is good too! You know I haven't seen any of your Christmas movies, Steffi. I wonder which ones the bunnies do - I know they do It's a Wonderful Life. Watching A Christmas Story has certainly been a holiday tradition of mine for some time now. I look forward to watching it again real soon. That's also interesting about the restoration ... and just fascinating how much of a cultural monument the film has become. It truly has become a cultural monument, Will. It's the perfect combination of humour and sentimentality. I know that it is an American landmark but we Canadians identify strongly with it as well (besides, I think the school is actually in Toronto). Once winter you really must come up here and test out the frozen metal pole phenomenon. I think I'm going to add all Christmas movies on Netflix this weekend. That sounds like an inspired idea, JACC, even though I'm not sure what Netflix is. But Christmas movies sound good right about now.